It’s all about summer eats finally – it’s warm and sunny in New England and the season kicked off on Martha’s Vineyard with a lot of restaurant work but I couldn’t be happier. 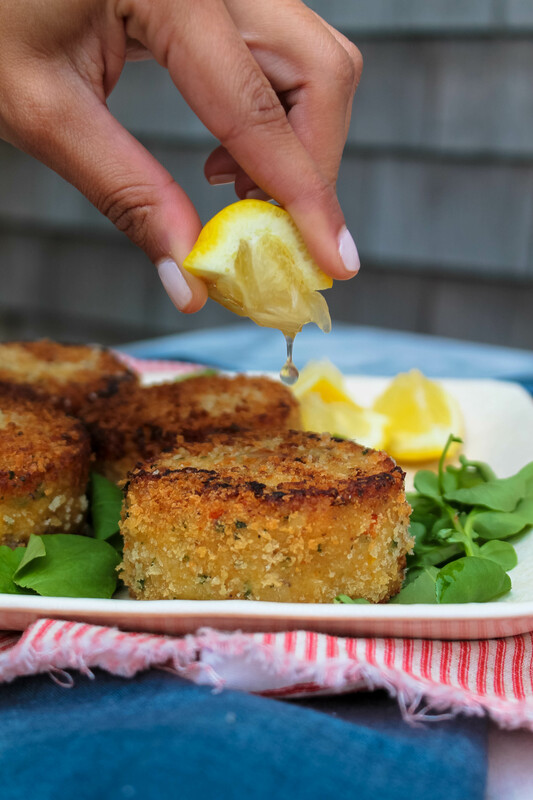 I’m sharing this recipe for deliciously Quick & Easy Fish Cakes thanks to Gorton’s Seafood, sponsor of this post. If you’ve been reading the blog for a while, you might know that I work at a private restaurant and golf club on Martha’s Vineyard, and that was the inspiration to this post. At the restaurant (where conveniently my husband also is a sous chef at), we make the best crab cakes in the entire world, no joke. While brainstorming for this upcoming recipe using Gorton’s Crunchy Breaded Fish Fillets, I wanted to create something brand new, not just the classic fish and chips or fish sandwich. And then I remembered the crab cakes at work and knew I could recreate that delicious recipe at home in a much easier, more approachable way! These Quick & Easy Fish Cakes start with Gorton’s Crunchy Breaded Fish Fillets, which makes them so much easier and MUCH more affordable than buying expensive crabmeat. The fish fillets are pulsed in the food processor, while a few are reserved to be chopped with a knife, to give the fish cakes a balanced consistency. Since the product does come frozen, all you need is to defrost them for a bit and then you’re on your way to delicious fish cakes! The fish itself is Alaskan Pollock, family of the cod fish, which is a high protein, low fat fish that is packed with heart healthy omega-3 fatty acid, so make sure to give it a try. After everything is pulsed and chopped, then the delicious ingredients come in: bell peppers, cilantro, red onion, lemon, and of course, some Old Bay. Once all of this plus some other ingredients you’ll see below are in, you can form these fish cakes with whatever you have on hand: a ring mold, an ice cream scoop, a spoon, or just roll on your hands and lightly flattened. Refrigerate them for an hour or so, bread them in panko, sear on both sides and finish them in the oven. 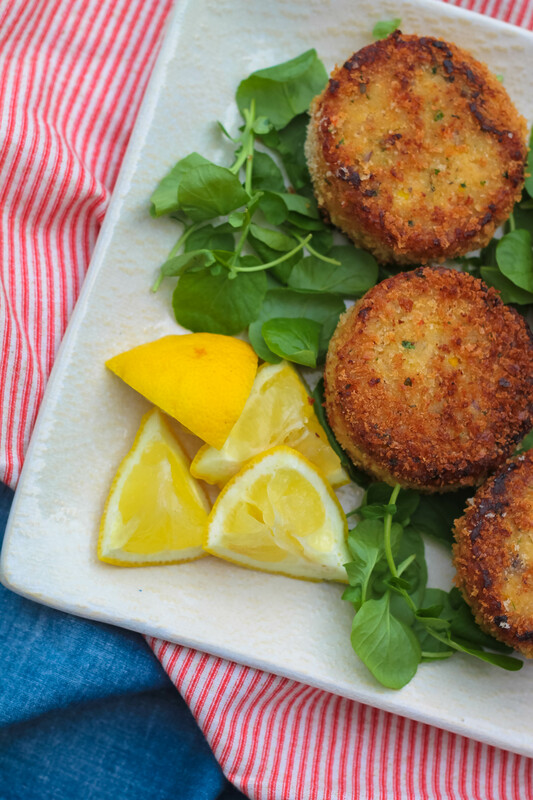 Serve these incredible fast and easy fish cakes with fresh lemon and a side salad, but you could also build them into a slider with some spicy aioli or use them as an appetizer for a weeknight dinner. Whatever way you serve them, I’m sure everyone will love these, how easy they were to make, and how impressed they will be when you tell them they’re made with the same 167-year-old company that has been trusted for quality food for decades – Gorton’s. 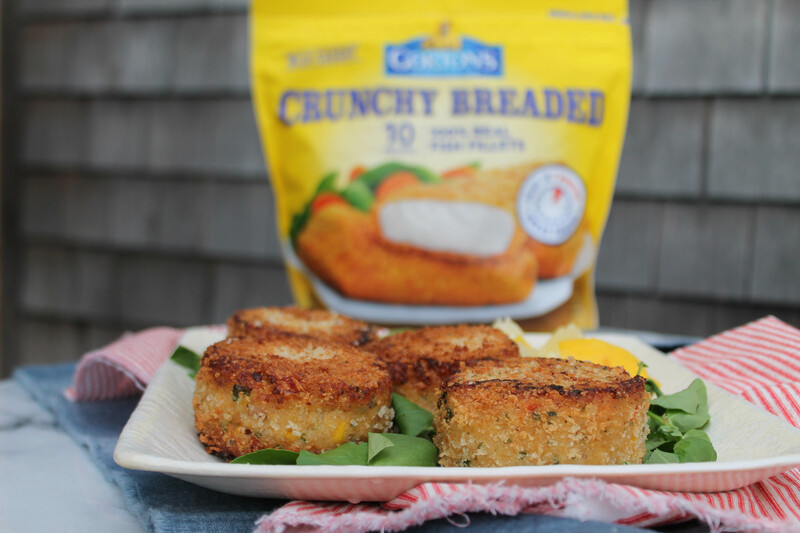 These Quick and Easy Fish Cakes are made even easier by using Gorton's fish filets! The flavors are incredible and can be served over salad or tucked between bread with a spicy aioli! Defrost the frozen fish for a few hours in the refrigerator. Once soften, chop 3 of the filets with a knife. The rest, place in a food processor and pulse 4-5 times to break up the fish. Place chopped and pulsed fish, along with the rest of the ingredients (except the 1 cup panko reserved for breading) in a large bowl and stir until combine. Using a ring mold, ice cream scoop, or your hands, form into cakes and place on sheet tray. Refrigerate about one hour to set and then coat in panko before frying. To serve: fry the cakes in one inch of canola oil on both sides to crisp and then bake in oven for 20 minutes to cook and warm through. Serve with fresh lemon and side salad. Disclaimer: Gorton’s Seafood sponsored this post – thank you for supporting brands that allow me to bring you new content.